Without awareness, there can be no change. Tough. Built-to-last. Durable. The Rhino, the namesake of Aquasana’s whole house water filters, is named for the Rhinoceros’ strength, determination, and grit that they exhibit every day, all over the world. But while our Rhino systems are long-lasting, the five main species of rhinoceroses are currently facing a widespread poaching crisis, nearing extinction. Some species have one horn and others have two. Their differentiation does not come from their color, but from their lip shape, which is determined by their diets. Black rhinos are grazers that munch on trees and bushes. They have a pointed upper lip, and that shape helps them grab leaves and fruits. White rhinos graze on grass, so their heads point downward, hence a square lip shape that helps them grab food. They can also weigh anywhere between 1.6 and 4 tons. Meanwhile, Javan rhinos are one of the most endangered species in the world, having been poached to extinction in India, Nepal, Burma, and Malaysia. Approximately 75 of them remain in total, all in Java, Indonesia. Sumatran rhinos are the smallest and the hairiest of the rhinos. Only about 275 of them remain due to widespread poaching. There are many reasons behind the disappearance of the rhino, but the primary factor is poaching. Rhino horns, illegally traded, go for as much as $30,000 per kilogram on the black market. Folk medicine practitioners believe that the tusk of a rhino can, among other things, cure cancer. It’s because of this belief stranger than fiction that black rhinos are hunted to the point where their numbers are becoming more critically endangered every day, while other members of the species are nearly extinct. For instance, Rhino poaching grew 9,000 percent between 2007 and 2014 with roughly 3 rhinos killed on average, every day. As certain industries like logging and agriculture continue to take over wildlife habitats, rhino populations are also affected. 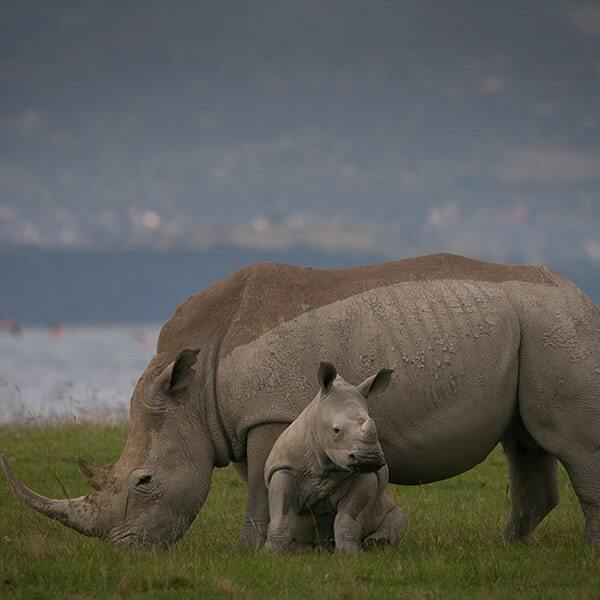 Loss of habitat not only affects the rhino’s ability to roam and feed, but it also affects the way they breed. As rhino populations continue to lose the lands they once called home, they have become scattered, secluded from other groups of rhinos. This has caused inbreeding within certain population segments, unfortunately leading to things like deformities and birth defects. How Many Rhinos are Left? According to Rhinos.org, black rhinos have suffered the greatest loss in numbers over the last decade due to poaching. The number of wild rhinos dropped a shocking 96 percent between the years 1970 and 1992, from 65,000 to roughly 2,300 in the wild. In 2015 alone, 1,338 rhinos were poached across the entire continent of Africa. To make matters worse, the 15-16 month gestation periods for female rhinos puts them at a severe disadvantage when trying to escape poachers and help their population rebound. But not all is lost, not yet anyway. Thanks to some intensive anti-poaching efforts over the last two decades, the number of African rhinos is now above 5,000, but that’s nowhere near their original numbers. What is World Rhino Day? World Rhino Day is an annual celebration and pledge drive on September 22. The holiday was started in 2010 by World Wildlife Fund South Africa to raise awareness for the plight of rhinos, educate the public that their horns have no medicinal properties, and help ensure funding for organizations dedicated to helping the rhino populations increase. Partnering with zoos, other nonprofits like the International Rhino Foundation, the BBC and so much more, the World Rhino Day is an annual pledge drive with a goal of £2,500.00. For ways to donate to the International Rhino Foundation, check the World Rhino Day Facebook page, or check the hashtag #KeepTheFiveAlive. Much like the rhino, our Whole House Rhino Filters are powerful, hard workers that never give up. Our 600,000 Gallon Whole House Rhino Filter is NSF certified to remove more than 97 percent of chlorine and chloramines for up to six years or 600,000 gallons. It filters at seven gallons-per-minute, so users don’t feel any change in their water pressure. They’re strong, resilient, and built to last. That’s why for the 2018 World Rhino Day, we partnered with the International Rhino Foundation (IRF) to see how we could give back. Here’s what we came up with: for every Rhino Whole House filter or replacement tank purchased from September 18, 2018, through September 24, 2018, we donated $10 (up to a total of $5,000) to the IRF. For 25 years, the IRF has championed the survival of the world’s rhinos through conservation and research. Based in the U.S., IRF operates on-the-ground programs in all areas of the world where rhinos live in the wild. In five countries across two continents, they support viable populations of the five remaining rhino species and the communities that coexist with them. To learn more about IRF, visit rhinos.org. With great pleasure, we’re also happy to announce that thanks to your efforts, the newest member of the Aquasana family is Rosa the Rhino! Sumatran rhinos, typically shy and secretive, tend to avoid humans and their settlements at all costs, preferring to live in thick, isolated forests and move mostly by night. Rosa somehow became used to being around humans, but unfortunately, this unique behavior put her in danger. That’s why she’s now located in the Sumatran Rhino Sanctuary under the protection of the IRF. She enjoys taking long walks and loves to sing — especially while wallowing in her mud holes. 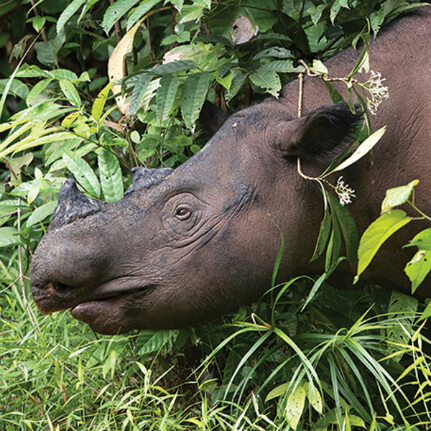 This vocal rhino is one of the last remaining Sumatran rhinos, and thanks to everyone who has purchased a system during our World Rhino Day event, she is now sponsored under the Aquasana banner. This means that Rosa gets 24/7 ranger protection, plus veterinary care, locally-harvested native food plants, and more. As the youngest female living in the sanctuary, Rosa has been continually monitored for maturity, and as of 2015, is now in the breeding program with Andalas. We’ll be posting updates on Rosa here, so please check back for more updates and the latest happenings with Rosa! What Else Can You Do to Help Protect Endangered Rhinos? At Aquasana, we believe clean water is the most important component of healthy living. While our Whole House Rhino saves you from water contaminants, you can help save the real Rhinos and their environment by donating to the cause of your choice on World Rhino Day. There are multiple options to choose from around the world to help Rhino cause – check it out, make yourself aware! International Rhino Foundation — For 25 years, the International Rhino Foundation has championed the survival of the world’s rhinos through conservation and research.